Limited Hand-Numbered Edition of 250 Copies on Blue Vinyl. 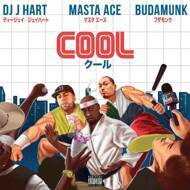 Paris-Born, NYC based DJ/Producer J Hart and Tokyo producer Budamunk, teamed up for a very limited edition 45’s (only 250 units pressed) featuring Masta Ace, Chris Rivers, HDBeenDope and Rim. This collector vinyl includes 2 exclusive songs: ‘Trinity’ produced by DJ J Hart featuring Chris Rivers, HDBeenDope, Rim and ‘Cool’ produced by Budamunk feat. Masta Ace and DJ J Hart. These 2 tracks were featured on J and Budamunk’s Double Dragon cassette tape, which was released exclusively in Japan by Jazzy Sport music label earlier this year. The 2 sides cover artwork was crafted by painting artist, Alexander Grahovsky.